Japan is extremely concerned about indications that America may pull out of the INF Treaty (Intermediate-Range Nuclear Forces Treaty) with the Russian Federation. Of course, for Japan, this would be a dramatic change to the geopolitical circumstances of Northeast Asia. Hence, the close neighborly space of Japan, the Russian Far East, and disputed territories between both nations may come under major military changes. This especially applies to the angle of American bases being stationed throughout Japan. It is known that President Trump of America isn’t just focused on the Russian Federation but also China because the INF doesn’t take this nation into account. Therefore, the militarization of China and not being part of the INF means that Trump believes that this treaty is inefficient in relation to China and the Russian Federation – based on different factors. In recent times, the Trump administration – just like the United Kingdom – is endlessly pointing the finger at the Russian Federation. This fact means that political elites in Moscow expect something new in the works because it is currently like a new Cold War. Indeed, over the last year, the same can be stated about China because this nation is also increasingly facing the wrath of America. Therefore, President Vladimir Putin of the Russian Federation will deem the threat of withdrawal from the INF to be in line with ongoing anti-Russian Federation policies. Political elites in Tokyo will be watching events closely because the decision may hinder relations with the Russian Federation, in relation to the territorial dispute. Irrespective of the position of America and the Russian Federation in relation to the INF, it is clear that Japan seeks a compromise between both nations. However, even if Japan says little openly, it is clear that Prime Minister Shinzo Abe will welcome attention being paid to China’s militarization. 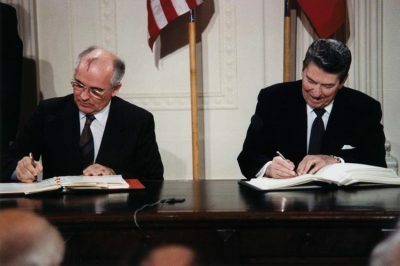 It could be stated that political and military hawks in both America and the Russian Federation may welcome the demise of the INF – or, at least a new framework that takes into account nations like China. Either way, Putin knows that Trump may score an own goal internationally if the Russian Federation maintains a moderate stance. However, for Trump, his focus is on protecting the interests of America even if international leaders oppose the logic of the Trump administration.